Get 6 months financing on orders of $99 or more. Stuff Points: Earn 950 points when you buy this stuff. Forget about old school bulbs, but don't settle for inferior quality LED set-ups either. This advanced grow light will outperform all others, but the benefits go beyond healthier plants and bigger yields. When you switch to the MAX 600, you will also save money on electricity, reduce your effort, eliminate the need for other lights, and you'll be able to grow without any additional fans or ventilation. It covers a full 4' x 4' area with an intense bright white light that fully saturates the space. Unlike other colorful versions, the full spectrum light produced by this unit will allow for vegetative growth and flowering without any changes necessary. It can support up to 12 full size plants, so this model is for the serious indoor gardener. It's designed by electrical engineers to exacting standards, and then manufactured in the US for superior craftsmanship. The result is a commercial grade fixture that produces more usable light than the competition. It provides a glow equivalent to a 600W High Pressure Sodium or Metal Halide bulb, but it draws way less power, and remains cool to the touch at the same time. Because light emitting diodes last ten times longer than traditional bulbs, you can use it constantly for several years without any dimming or failure to worry about. For bigger plants, healthier growth, and a more abundant harvest, this LED grow light is tough to beat. This is the largest system in this line, but we also carry the two smaller ones. For experienced users that will be growing several plants, the value offered by the MAX 600 is a great choice. This model has 384 LED's and can support a dozen regular sized plants, for a lower capacity light, check out the MAX 400 which can handle up to 9 plants, or the MAX 200 which is rated for 4. All have the same overall size, so they all fit in similar spaces, but the number of light strips will increase with price and ability. Natural Light. More similar to the sun's rays than the competition, the full spectrum light is better for plants, and more convenient for you. Other systems require you to change lights when it's time to flower. With this one, you don't have to change anything bu the timing. Commercial Grade. Designed by electrical engineers, and then assembled to exacting standards. Only the best components are used, and each unit undergoes rigorous quality control to ensure top of the line functionality, and long lasting durability. Maximum Longevity. The cost of replacing traditional bulbs can really add up over time. The high quality LED lights on this unit will last for many years before replacement is necessary. Use it constantly, and never worry about dim bulbs or ones that go dark. Better Transmission. On top of producing more usable light than most, you can also keep these clean easier so more will make it to the leaves of your plants. The cool bulbs can be wiped at any time to remove dust and other particles that may be blocking the glow. Totally Quiet. Other LED rigs have built in fans, and traditional bulbs require full blown ventilation systems to remove the heat. This one does not require any of that, so it will run so whisper quiet, you won't even know it's on. Cool To The Touch. Proper design keeps the diodes and everything else cool without any additional fans. With no heat created, you won't have to worry about sucking it out of the area, or plants wilting. No Extra Power Supply. Just plug the cord into a standard outlet. No special power supplies or additional ballasts are needed. High Capacity. Cover a large area, and saturate every inch with bright, usable light. This powerful grow light can support 12 plants. Advanced Diodes. It begins with the most advanced components on the market, and then continues as each one is custom binned to provide the correct spectrum of light. The result is a more efficient glow, and more usable light for your plants. All this, and it still draws less electricity than the competition. When other manufacturers rate their lights, the test the very middle of the space, right under the center of the glow. This will always give the highest possible rating, but it does not provide a clear picture because as you move outward, the rating will decrease drastically. If you are only growing a single plant, this is not any issue, but if you intend to utilize the full space, you'll want a unit that distributes intense rays to the entire area. 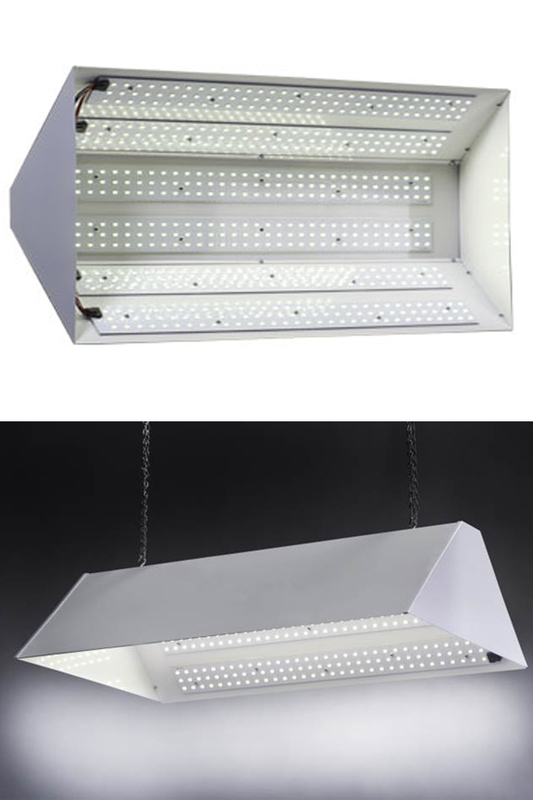 MAX Grow lights are designed to provide the highest PAR ratings per watt over the entire growing space, you will have healthy growth over several plants, and in a larger area without any rotation necessary. The advanced design of this system allows for more usable light over a wider area, and the full spectrum glow guarantees vigorous growth with little effort required. Stop wondering why your plants are yellow, and get a better grow light. This unit offers one of the easiest ways to increase the quality of your plants, and it does so while reducing costs and eliminating complicated steps and additional infrastructure. It's the next best thing to growing outside, and it will allow you to turn any space in your home into an indoor farm. Quickly grow fruits and vegetables from start to finish in about eight weeks. Start clones and seedlings indoors before transplanting to an outdoor garden, or grow fresh local produce all year long in the comfort of your own home. Dimensions 25" x 15" x 6.5"
# LED 384 High Power Diodes in six strips. Full Spectrum Yes. Use the same light for vegetative and flowering stages of growth. Cool Bulbs Yes. No fans needed. Light remains cool to touch during operation. For high capacity indoor growing, this LED grow light is guaranteed to cut costs and improve your harvest. Unlike other similar units, you don't have to switch lights for flowering, and there are no colorful glows. Add quality and convenience to your indoor farming operation. Order Yours Today! 4 Plant Capacity. Full Spectrum Convenience. Increase Yield And Save Money!